Scientists at Stanford University have found a way to program DNA in such a way that genes can be turned on or off in living cells. Incredibly, the new tool can affect two different genes at the same time, an advance that will allow scientists to treat even the most complex genetic disorders. 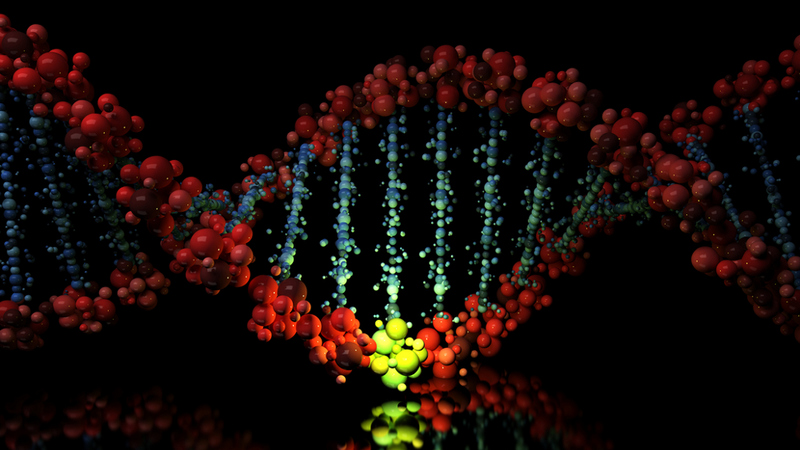 There are tens of thousands of genes in the human genome. Trouble is, nasty things can happen when even a single gene or gene sequence fails to activate, or if a deleterious mutated gene turns on. So how great would it be if we could find a way to enable or disable specific genes? A research team led by Stanford scientist Lei Stanley Qi has now figured this out. In their new paper, which appears at the journal Cell, the geneticists describe a new system in which a kind of "programmable" genetic code can be used to selectively activate or deactivate genes. To do so, the scientists leveraged the power of the CRISPR/Cas9 gene editing system. But instead of using the "cut-and-paste" method of editing genes, the scientists rejigged the CRISPR molecule to include a second chunk of information on the RNA — a piece of information that tells the molecule to either boost or reduce a target gene's activity, or to just switch it on or off completely. By manipulating these genetic switches, the researchers have harnessed the power of genetic programming. Not only that, the system can influence the state of two different genes simultaneously. This is important because of the cascading influence of genetic activations; within a cell, the precise order or degree to which multiple genes turn on can create different results. Some of them not so good. "It's like driving a car," noted Qi in a Stanford release. "You control the wheel to control direction, and the engine to control the speed, and how you balance the two determines how the car moves. We can do the same thing in the cell by up- or downregulating genes, and produce different outcomes." To prove that the new tool works, the scientists took control of an important yeast pathway, and they tested it on two mammalian genes important to cell mobility. In both cases the new system worked. They are complex because they are caused not by a single gene but by many genes. For such disease, we call them "polygenic diseases". For example, Alzheimer's disease that causes neuron degeneration is frequently found to be associated by 7-10 abnormal genes. The same is true for some types of diabetes, and many cancers. There are two major challenges to study and treat them. To study them, we'd like to control multiple genes and see how they lead to the symptom; and on the therapeutic side, we'd like to hit many gene targets and correct them altogether. The exciting point of our current technology is that is allows one to simultaneous turn on a set of genes and turn off another set, thus serving as a solution to both challenges. As the next step, we'd like to test the system in whole animals such as mice. The animals provide a powerful testcase for studying diseases and seeking new treatment methods. For example, these are many disease model mice that have been created to study neuron degenerative diseases, ageing, cancers, and cardiomyopathies. Most of the current animal models are created for single gene diseases. To study multi-gene diseases, we believe our tool will be unique and effective. The applications is this dramatically broadens our research scope of the diseases that can be studied in a whole organism. It also leads to new gene therapy with added complexity. RNAi has been used as a gene therapy approach to repress a gene which can be directly delivered into the human body for treatment. The engineered RNAs in our technology expands this and can be similarly used but to simultaneous control many genes differently, suitable for treating more complex diseases. He says they could eventually synthesize tens of thousands of RNA molecules to control the genome over a whole organism. Whoa. The mind boggles at the implications. Read the entire scientific study here.